Ever have a book where you just eye roll and eye roll and eye roll, yet also can't stop reading it? That's my experience with Hungry. Like, I enjoyed it -- this definitely wasn't a hate-read, where I just push through a bad book because I'm so disgruntled and just want to see how much worse it can get -- but at the same time, I just had so many questions and so many problems with it as the story went on. 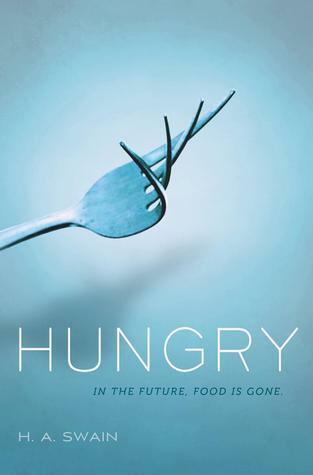 Hungry takes place in the not-too-far future, maybe just a few generations off. Thalia lives a life of great privilege, as her parents are very important in the One World corporation which basically controls everything. Great advances have been made in science and technology, and here's where you have to start just handwaving things and saying "I choose to believe this is true because the book says it is, but I don't think science works like that". The worldbuilding is interesting, but don't think too hard about it, because it might start to fall apart. Thalia's an interesting lead character because she's kind of a mini-rebel, being interested in "retro" things and causing trouble by hacking the One World systems, but what she doesn't realize is that she's never going to face any real consequences for her actions because of who her family is. Like, they might roll their eyes and go oh Thalia but that's about it. That all changes as the story goes on and Thalia gets caught up in the movement against One World. She's frustratingly naive at times, because despite her sheltered existence, she still should expect things like "your fancy tech gadgets are going to make it real easy to track you when you're on the run". I did enjoy her journey to really understanding how the "other half" lives, and her mistakes and assumptions make sense, but that doesn't mean they're not frustrating. The romance with Basil was definite insta-love and kind of annoying with how quickly she was like IS THIS LOVE? I THOUGHT I'D NEVER SEE YOU AGAIN blah blah blah. Basil seems to have some pretty abrupt personality shifts throughout the book which can be jarring, but they make a little more (not a LOT more) sense once you understand his back story. There's some weird political undertones that happen here that I'm not quite sure I know what to do with. I want to talk more about it, but it's kind of spoilers? I don't know if the author's trying to push a specific agenda of their own, or what, but there was something about the way everything was set up that made me kind of ... itchy. That's very vague and unhelpful, I know. The ending is very chaotic, and even though I'm writing this the next day after finishing the book, I still feel like I need to go back and read it again. The author has something interesting going on here, and while this wasn't my favorite book, it wasn't awful and I'd probably pick up the surely inevitable equal. Great review! I can totally see where you're coming from. I did enjoy the book, although lots of eye-rolling may have happened with me. And the insta-love thing was annoying as well. You can read my review of this book HERE.